I have discovered that I can replicate the bolting used in my FEA study use to share the same geometry as my actual bolting used. I have found that you can do this by clicking "Toolbox fasteners to bolts" which apparently is in the "professional" package. However i do not have the option shown in the picture below. Is there an add on that i have to click to allow for this feature? 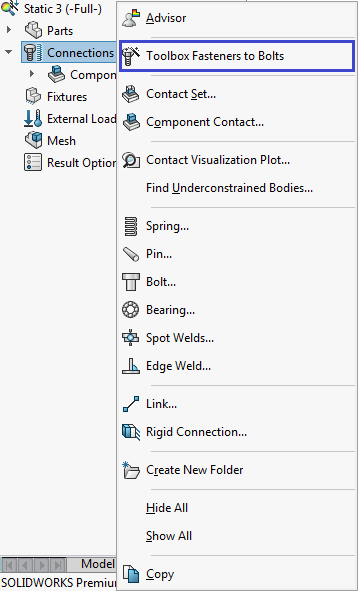 First thing is: that option only works if the toolbox in your model are created using SW toolbox not any customized ones. You also must have SW Sim Pro or Pre licence.